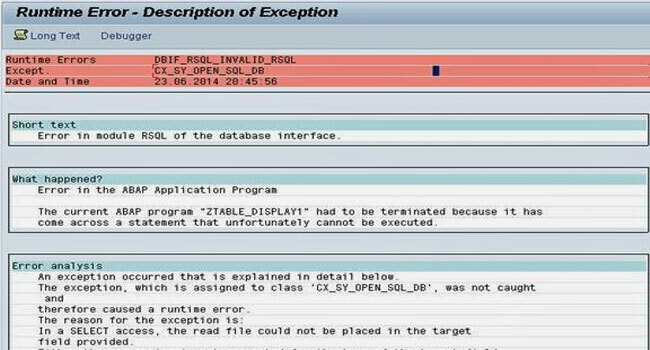 We are getting following ABAP Runtime Errors DBIF_RSQL_INVALID_RSQL while working with 'Process Chain Analysis' in 'BW-Tools' in transaction ST13. You are getting this error because this dump occurs due to an issue with the BPC statistics data stored in table uj0_stat_hdr. You can solve the issue by reducing the amount of records (statistics) by executing report UJ0_STATISTICS_DELETE. And the report can be created with SAP 1648137 - 'Improvement for BPC statistics'.